It's really hot in the Ottawa area this week. It was 29C yesterday and with the humidity felt like 37C. There's not much to do but sit under the fan or, with the aid of a couple of noodles (hey, that's what they call them - for my Brit friends, it's a woggle), float around the pool. The water temperature was 32C which works out to 90F. No twerkin' for this fella this week. Needless to say one's mind kinda turns to mush and maybe it was sunstroke or sumpin' but after a while my mind started to wander. Then I popped open a Corona and I sat down to pull this post together. ...the audience erupted into claps, hoots and hollers because they immediately got the joke and the joke was on us. I don't think anyone would call Cohen's voice golden but it nevertheless is haunting, mesmerizing even. But as I get older I often think of those lyrics - not the golden voice ones - those other ones. That's quite apt when you think of it. Well, it is when I think of it. At the risk of scaring most of you away - because good old Bob can be an acquired taste - here he is performing the song in the movie The Last Waltz with The Band in 1976... Two versions of the song were originally released on his Planet Waves album in 1974. May you all stay forever young. Time for another Corona. Stay stupid my friends. We'll see you next week. Love all those lyrics. As far as aging, I am not loving the lightening quick passage of time but appreciate that I am still feeling youthful on most days. It does seem that the older I get, the faster time appears to move. I won't have any trouble with the "stay stupid" part of your post. Have a great day, dufus and enjoy floating around the pool. You know I remember as a kid summer holidays seemed so long that I actually couldn't wait to go back to school. Sick, I know. Now time just seems to fly by. I don't know where the heck it goes. Of course alcohol may have something to do with it. I love Leonard Cohen too. He and his golden voice are a National Treasure. You're welcome. Sincerely, N. Dufus. Indeed he is. He was absolutely wonderful when we saw him a couple of years back. He had the audience in the palm of his hand. They both have such distinctive voices. I adore listening to a young Dylan when his lyrics were clear and understandable. "Needless to say one's mind kinda turns to mush"
My brain is FRIED from this weather. Seriously, I cannot think clearly AT ALL. PS: I puffy heart all things Bob Dylan. You know, Mrs D says the same thing, although "adore" might be too strong a word. Dylan, Young, Cohen and Clapton would be my top four. We are all in this together. Except for me, I've found the fountain of youth but I am not sharing it so don't ask. Oh, I love it too but did you know that last year Time magazine listed it as one of the ten worst Dylan songs. Go figure. What do they know? Joan Baez wrote a great song about them, called 'Time Rag'. http://bit.ly/18jPxCY It's about an interview they did with her. Yeah, I've a;ready pre-ordered it. I'm just thankful for air conditioning and iced coffee myself in this heat. Not until I patent it. We shouldn't complain. I complained all winter about the cold and the snow. But then I'm old, eh, and I love to complain. Amazingly, I keep finding stupid things to do no matter how old I get. Go figure. I find stupidity increases with age. 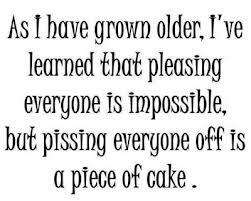 But then I'm at an age that I don't care. Neither do I... next time I visit we can think up something else stupid to do. Great! No shortage of stupidity here. You're young and don't know any better, Bryan.